A new Bloom Attacker, and a New Bloom Supporting Stride. Act (RC) GB2: [Choose 1 card from your hand, discard it] If you have a “Ranunculus” Vanguard, during that turn, this Unit gains “Cont (VC): This Unit can attack from the back row.”. Bloom – Auto (RC): When this Unit or another of your Units with the same name is placed on (RC), during that turn, this Unit and all Units in the same column all gain Power+4000. Auto: [Counter Blast 1 Card] When this Unit is placed on (VC), you can pay the cost. if you pay it, choose up to 1 card from your hand, Call it to (RC), during that turn, that Unit gains Power+5000. If the Called Unit has the Bloom ability, Counter Charge 1 Card & Soul Charge 1 Card. 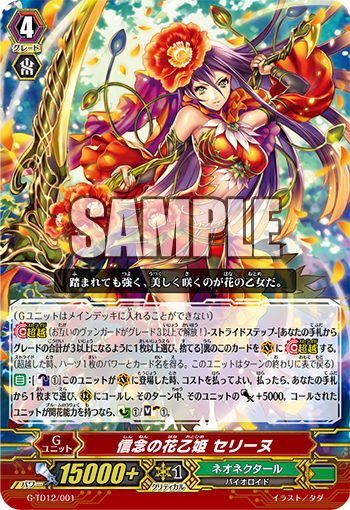 • “Flower Princess of Faith, Celine” who supports 【Bloom】, included in the Trial Deck “Flower Princess of Extravagance”. “Stubborn Maiden, Noel”, has a 【Bloom】 ability that activates when a Unit with the same name is Called, granting Units in the same name Power+4000! And if you achieve GB2, and you have a “Ranunculus” Vanguard, you can attack from the back row! It’s fairly reliable since it becomes possible for it to attack a Vanguard feven from the back row. And with 【Bloom】 that powers up all of your Rear-guards in success, you can potentially aim for 6 attacks fueled by a High-Power board using your Vanguard and “Noel”. With “Flower Princess of Balmy Breeze, Ilmatar”, who grants an On Hit ability to all of your Units, you can complete an already powerful board. When building a Deck this is definitely a card you’ll want 4 copies of. “Flower Princess of Faith, Celine” is a G Unit that’s ideal for your first stride. You Call a Unit from your hand, and it gains Power+5000! And if that Called Unit has the 【Bloom】 ability, you can Counter Charge 1 Card and Soul Charge 1 Card. If you match it with the Stride Skill of “Ranunuclus Flower Maiden, Ahsha”, you can Call a Unit from your hand with the same name as a previously Called Unit, then the skill of “Ranunculus” Calls a Unit with the same name from the Deck, allowing you to power up Units that activate 【Bloom】, you can assemble a powerful board even early on. “TRY3 NEXT” contains many Units with 【Bloom】 abilities. There’s also plenty of cards that work well with Ranunculus. So keep an eye out for further information. Q. If “Stubborn Maiden, Noel” is a Rear-guard, if you Call a “Stubborn Maiden, Noel” to the same Rear-guard Circle, do you apply the “During this turn, this Unit and all of your other Units in the same Column gain Power+4000” effect? A. It isn’t applied. When exercising the Bloom Auto Ability, the original “Stubborn Maiden, Noel” that the new Unit is being placed on top of is placed in the Drop Zone, so it doesn’t count as being a Unit in the same Column.